Will I ever again see Your glories?" "It is not enough to simply advertise repeatedly that one is a devotee of Mahaprabhu saying, 'I am Gaura's, I am Gaura's.' The result of being the Lord's Follower come to one who takes up Mahaprabhu's preaching mission as well as the practices taught by Him." Some of us affirm, with conviction, that we follow Sri Caitanya Mahaprabhu, have faith In Him, and are devoted to Him. When we interact with Vaishnavas from other traditions that do not have the same regard for Mahaprabhu that we do, we strongly rebuke them; And criticize them in articles and speeches. There is indeed a general notion among ordinary people today that Mahaprabhu is accept-ed throughout the world and that no one truly rejects Him. However, if we look deeply We find that very few of us truly follow Mahaprabhu. In fact, fearing to be called atheists For not offering respect to the Vedic scriptures and the Supreme Lord or of being vilified By the public in general, we claim to honor Mahaprabhu, but all we are really interested In is our own prestige. There is, these days, a class of people who, leading a reckless private life and following The partial discipline of the smartas, act permissively and whimsically and still dare to Publicly criticize the true followers of Mahaprabhu. Dismissing Mahaprabhu's teachings As sectarian, they neglect the standards of Vaishnava conduct and yet profess to know the Lord better than His devotees do. Thus they criticize in their publications the great Personalities who have dedicated their lives to Mahaprabhu's service, making Him the Ultimate goal of their lives. However, the honest inquirer finds that these people are affected by the disease of self- deception, of weakness of character, of dishonesty. The arrogance of these people has Nothing to do with true acceptance of Mahaprabhu and His message, but is only proof of sickening attachment to personal prestige and sense gratification. If we ask ourselves, "Are we truly following Mahaprabhu?" and then honestly seek the answer, we must first examine not only Mahaprabhu's own teachings and conduct, but those of His personal associates, through whom the Lord spread His message. We must then ask ourselves how closely we follow those teachings, especially in times of personal difficulty or social disapproval. Sadly, some people accept as Mahaprabhu's teachings only those portions that are convenient to their life styles or frame of mind. Such people believe that Sri Rupa, Sri Sanatana, Sri Jiva, Krishnadasa Kaviraja Goswami,Vrindavan dasa Thakura and other intimate associates of the Lord profess doctrines that in reality are different from Mahaprabhu's. They even go as far as to claim that Mahaprabhu's followers are narrow-minded sectarians who have made many exaggerated claims about the Lord's person and teachings. Thus they refuse to accept the statements of Mahaprabhu's associates as authoritative. But when genuine teachers of the doctrines of Vaishnavas expose these people's mock following of Mahaprabhu, showing that, for all intents and purposes, it is actually opposition to the Lord, they become angry and verbally attack the devotees. The self-styled followers of Mahaprabhu call these utterances of Vrindavan Dasa Thakura violent and intemperate, and proof of the fanaticism of Vaishnavas in general. Their imaginary approval of Mahaprabhu is based on a rejection of the Lord's associates which is deep rooted in malice and malevolence. They, convinced that devotion is nothing but sentimentalism and unfounded enthusiasm, consider Mahaprabhu's devotees incapable of understanding the Lord's true nature. But they believe themselves, as independent third parties, capable of such understanding. The extant of the arrogance manifest in such a claim is completely beyond even their own comprehension. Such is the type of person that prominently propagates its ideas today on the editorial pages of newspapers and from podiums of various public assemblies. Other illegitimate modern-day followers of Mahaprabhu also are those who make a show of accepting Mahaprabhu and His associates, but actually profess all manners of heterdox views. Like wolves in sheep's clothing, these pseudo-Vaishnavas pose as orthodox thinkers, making a hypocritical display of devotion while actually being infected by caste consciousness, monism, or the so-called philosophy of synthesis (samanvaya-vada). These characters make a show of accepting Mahaprabhu and His close associates, but protest either openly or anonymously when Mahaprabhu's surrendered devotees fearlessly preach the Lord's message as it is. These duplicitous frauds tolerate the brow-beating of the impersonalist or the caste Brahmins, but when a bonafide acarya speaks out they are unable to tolerate it. Due to excessive sentimentalism and lust, these sahajiyas have become so inflated in their egotism that when told that Mahaprabhu's teaching and example direct one to give up bad association, they object, unwilling to give up their sensuous ways. In the Chaitanya Charitamrta, the story of Chota Haridasa is told as a lesson for potentially deviant followers. Certain aspects of Chota Haridasa's conduct were displeasing to Mahaprabhu and are to be avoided. When Krishnadasa Vipra was tempted away from Mahaprabhu's association by the Bhattathari woman, he was not acting as a branch of the Chaitanya desire tree of divine Love. Giving up the direct service of the Lord to consort with these woman, he was not keeping with what is expected of an eternal associate of the Lord. When in Vraja, the Lord's companion, Balabhadra Bhattacarya, wanted to leave the service of Mahaprabhu-Krishna Himself- to see the supposed reincarnation of Krishna in Kaliya lake,his behavior was not in accordance with the true standard of an eternal companion of the Lord. Sarvabhauma Bhattacarya supported the smarta and Mayavada philosophies and even refused to accept Mahaprabhu as an incarnation of Lord Krishna. His is another example of conduct uncharacteristic of the branches of the Chaitanya tree of divine love. Many such examples are found throughout the accounts of Lord Chaitanya's lila. There is the instance of Jagai and Madhai's sinful existence and their violent behavior towards Nityananada Prabhu and Haridasa Thakura, and their opposition to the chanting of the Holy Name. There is Gopinatha Pattanayaka, who stole from the royal treasury. Kamalakanta Visvasa, Advaita Prabhu's disciple, perceived Advaita to be in dept. Brahmananda Bharati, one of the roots of the desire tree of divine love, wore a deer skin,the dress of a Mayavadi sannyasi; and Mahaprabhu did not approve of this and corrected him. Vallabhacarya, who is identified in the Gaura-ganoddesa-dipika as an incarnation of Sukadeva, proclaimed his own commentary on the Bhagavatam to be superior to that of Sridhara Svami- this kind of arrogance is not characteristic of a Sukadeva. Devananda pundit, also counted among the branches of the Chaitanya tree, tolerated offenses to Mahaprabhu's dear associate, Srivasa Pundit, he contemplated liberation; and interpreted the Srimad Bhagavatam in ways that opposed its true purport of devotion to Krishna. This is certainly not befitting an eternal companion to the lord. Sentimentalist prakrta-sahajiyas find it painful to hear such criticism of conduct that was disapproved by Mahaprabhu himself, But just as a good doctor does not hide his diagnosis in order to please the patient, the devotees of the lord do not hide from the fact that progress in spiritual life is dependant on giving up attachment to bad company, sense gratification, and immediate pleasures. The devotee does not withhold good advice out of a desire to deceive and flatter. If the straightforward, direct and honest devotee says that engaging in illicit sexual activity is determined to spiritual life and advises one to give it up; or if he tells someone overly attached to wife and children to give up that attachment, these are beneficial instructions. When spoken, the truth may cause pain, bit the devotee would rather speak the truth out of kindness than add more fuel on the fire of people's material attachments. We may be very vocal about following Mahaprabhu, but when he declares that the essence of Vaishnava conduct is to give up bad association such as the company of womanizers and non-devotees, shall we call him cruel and unkind? Mahaprabhu called Chota Haridasa a "monkey renunciate," one who has given up the appearance of interest in sensual life but goes on to flirt with woman and do other things contrary to the vaishnava rules of conduct. Mahaprabhu said about Chota Haridasa that the only atonement for this grievous deviation was to drown himself. Shall we then call Mahaprabhu cruel and unkind? Shall we deny that he ever said such a thing? Shall we rather try to establish that Mahaprabhu approves of our own loose standards of worldly behavior? If we go about giving speeches in public assemblies to this end, is it not simply proof of our own dishonesty? We may say, "I accept and follow Mahaprabhu," but despite point-by-point evidence in Mahaprabhu's teachings, we do not accept that the only way of attaining God is devotion characterized by chanting the Holy names. Nor do we accept that karma, jnana and yoga are indirect and troublesome paths full of hornets, ghost, and poisonous snakes. Mahaprabhu and His followers sometimes called other spiritual paths " poison chalices," or " worse than hell," but we insist that these statements are not to be taken literally and that Mahaprabhu was making exaggerated claims in order to promote His doctrine. Is this accepting Mahaprabhu as He is? We want to fit Mahaprabhu's doctrines into the mold of our own subjectivity. Are we then not giving more weight to our own fancies or to current public opinion than to Mahaprabhu? When we put bhakti on the same platform with jnana or karma, are we not in effect rejecting bhakti? Mahaprabhu used the word satitva, or wifely chastity, to describe the attitude of a devotee who does not mix his devotional service with jnana or karma, or obscure his devotion with desires for sense enjoyment or gratification, all of which He compares to marital infidelity. When we say that bhakti is just one of many different ways of attaining the Supreme, we are saying, in effect, that a wife who cheats on her husband and one who is chaste and faithful are equal. No doubt those sects that promote illicit sexual activities will be glad to hear such tidings, for this liberal attitude gives their transgressions legitimacy. But normally, a respectable person objects to the idea that his chaste mother is on the same level as a prostitute. Of course, a wicked individual or a prostitute has no problem with a righteous man or a chaste woman being derided in this manner! They simply think, "Welcome to the club!" Privately and publicly, the world has introduced infidelity as part of Chaitanya Mahaprabhu's pure doctrines. Thus quite naturally, many misled persons try to put their infidelity on the same level as the behavior of the chaste pure devotees of the Lord. This they call "the doctrine of synthesis." Like an infectious disease, this philosophy has spread from a few individuals to the society at large. Is it any surprise that Mayavada is rapidly proliferating in the world? So this is how we "honor" Mahaprabhu. We call our opposition to Mahaprabhu's doctrines " honoring" Him in order to keep up our public image. Some of us actually believe that by making a public show of accepting Mahaprabhu we are doing Him a service rather than ourselves one: " I am a brahmin and I honor Mahaprabhu. I have studied so much and I accept Mahaprabhu. I have a big, important job and I follow Mahaprabhu. I am a rich man and I accept Mahaprabhu. So Mahaprabhu is beholden to me." Others say that they will boycott Mahaprabhu if He opposes their imaginary concept of what is true religion, truth, service, or welfare work, even if his devotees can show from scripture that Mahaprabhu's position is orthodox. How can anyone claim this so-called acceptance of Mahaprabhu as authentic? Aren't we rather accepting our own whims and preferences as our authority? The teachings of Mahaprabhu cannot be changed to suit our own whimsical ideas. "In this age of quarrel and hypocrisy the only means of deliverance is the chanting of the holy names of the Lord. There is no other way; there is no other way; there is no other way." "Lord Krishna alone is the supreme controller, all others are his servants. As He makes people dance, so do they dance." "The external potency of Maya, who is of the nature of the shadow of the cit potency, is worshipped by all people as Durga, the creating, preserving and destroying agency of thes mundane world. I adore the primeval Lord Govinda in accordance with whose will Durga conducts herself." "Just as, by the action of acids, milk is transformed into curd but yet the effect of curd is neither the same as, nor different from its cause, viz., milk, so I adore the primeval Lord Govinda of whom the state of Sambhu (Shiva) is a transformation for the performance of the work of destruction." "I adore the primeval Lord Govinda, whose lotus feet are always held by Ganesh upon the tusks of his elephant head in order to obtain power for his function- destroying obstacles on the path of progress of the three worlds." "The sun, king of all planets, full of infinite effulgence, the image of the good soul, is the eye of this world. I adore the primeval Lord Govinda in pursuance of whose order the sum performs his journey mounting the wheel of time." In all these verses we find endorsement of Mahaprabhu's rejection of the smarta doctrine of the Pancopasakas, or worship of the five deities-Shiva, Durga, Ganesh, Surya, and Vishnu. But sespite the clear evidence from Brahma-samita quoted in Mahaprabhu's teachings, Pancopasakas cling to their doctrine, arguing that the Vedas themselves authorize this process of polytheistic worship. They affirm that Mahaprabhu Himself visited the temples and holy places connected to these deities, prayed to them and danced before them. They further argue that if Mahaprabhu did not accept a type of worship that is authorized in the Vedas, then the Vaisnava religion must be considered out of line with the Vedic literature. Indeed, some foolish deviants desclare that Mahaprabhu's religion in not Vedic. Influenced by public opinion, we toss all these gheterodox ideas about in our heads. There are indeed many manes of gods in the Vedic literature, but only Vishnu is referred to as the supreme diety above all others, and independent of them. The most ancient of the Vedas, the Rgveda-samhita, clearly states that Vishnu is superior to all gods. "Agni is the least of the gods; Vishnu is supreme. All other gods are somewhere in between these two." The Bhagavad-gita and other Vedic scriptures clearly state that the worship of any god other than the Supreme Lord in incorrect and goes against the Vedic principles. Gaurasundar may have visited numerous temples dedicated to gods and goddesses, and shown them respect, but He never considered them to be independent or supreme. Rather, He considered all the gods and goddesses to be servants of Vishnu, and therefore devotees, or Vaisnavas. In this sense only He considerd them worshippable. Otherwise, according to the Pancopasana understanding, the fice gods are worshipped purely functionally and within the temporal world. 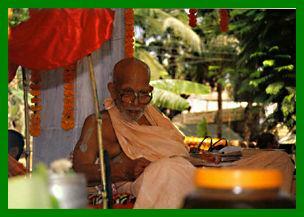 The goal of the Pancopasana is to fo beyind these deites' various forms and merge into the impersonal Brahman. At the end of the puja, the five deity forms are ultimately abandoned in the visarjana ceremony. Mahaprabhu accepted that Vishnu and the Vaisnavas have transcendental forms of eternity, bliss, and knowledge. Shiva, Durga, Ganesh, and Surya worshiped by Mahaprahu are the order carriers of the Supreme Lord Vishnu in His above of Goloka-Vaikunth. There these deities are His eternal associates, and thus never purely functional and to ever be discarded. Who then are the true followers of the Veda, the Vaisnavas or the Mayavadis or the Mayavadis and Pancopasakas who simply consider these forms imaginary and as convienevt objects of worship to ultimately by discarded? Who showed greater respect of Shiva, Ravana, or the Pracetas? Therefore the question: Are we truly following Mahaprabhu? Or are we following Him according to our own convenience, our own tastes and imagination?